Billlionaire eBay founder Pierre Omidyar is donating $100,000 to NeverTrump PAC, a fledgling super PAC that registered with the Federal Election Commission on March 4. Omidyar, 48, is number 163 on Forbes’ list of the world’s billionaires, with an estimated net worth of 7.8 billion. The Hawaii resident made his fortune from eBay, the popular online auction site, where he still serves on the board. He and his wife, Pam, are major philanthropists, and have poured hundreds of millions of dollars into projects centered around human rights, economic development, government transparency and media, among other areas. 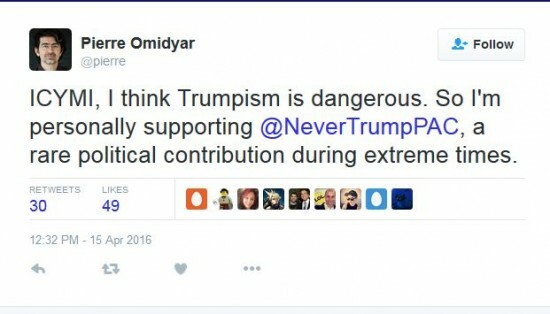 Omidyar’s dislike for Trump is no secret. He has made his antipathy toward the candidate clear on Twitter. Pierre and Pam Omidyar have combined to give nearly $200,000 to the Democratic Senatorial Campaign Committee over the years and about $150,000 to the Democratic Congressional Campaign Committee. Both Pierre and Pam Omidyar supported Democrat Hillary Clinton during her 2006 U.S. Senate re-election campaign. Pam Omidyar donated to both Clinton and Barack Obama during the 2008 presidential race, while Pierre Omidyar did not donate to any presidential candidate that year. Neither has yet made a personal contribution to any 2016 White House hopefuls, according to FEC records. High-profile Democratic candidates to whom Pierre Omidyar has donated in the past include House Minority Leader Nancy Pelosi, D-Calif.; Senate Minority Leader Harry Reid, D-Nev.; and Sen. Dianne Feinstein, D-Calif. His most recent federal political contributions came in 2010, records indicate. Pierre Omidyar has given money to only a handful of Republicans including former President George W. Bush, former U.S. Rep. James Greenwood of Pennsylvania and former U.S. Rep. Jeb Bradley of New Hampshire. Between 1999 and 2010, he also donated $55,000 to the political action committee of eBay, which supported a number of Republican and Democratic candidates.